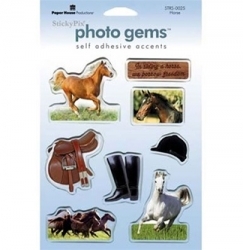 These adorable horse stickers are the perfect accent for all your scrapbooking ideas. They are self adhesive and "puffed" to add texture to your pages. Comes with horses, saddle, boots & show hat stickers. Perfect for all scrapbooking designs and they would make a wonderful gift.